I use many tools and applications on a day to day basis. Some are specific to my job in networking and security, others to my development work, but some tools I use across the board, regardless of the "mode" I'm in. Here I'm going to look at five of the tools I use regularly, and I recommend them to you if you have similar needs. Pocket is a tool for saving webpages for reading later. I started to use it many years ago, when it was just a browser extension that needed no sign in. There were some changes, so I stopped using it, but in 2017 Pocket was acquired by Mozilla, and it became a standard part of the browser. Since then I don't think there's a day that goes by when I don't click the save to Pocket button at least once. Pocket syncs across all my devices (two Linux machines, my Android phone and also my Kobo) so it's really handy. Quite often I'll see an interesting article and think "I haven't time right now", so it'll go in Pocket. I could just use bookmarks / favourites, but the problem is I wouldn't go back and look through them. I've alluded to Pocket syncing on my Kobo reader, and that's where I read the articles most. Pages are saved offline, so it doesn't matter if I'm connected or "off the grid" and all the extra fluff (you could call it lint? Sorry, couldn't resist the pun) on the pages (adverts etc.) are removed, giving me just the article. I've caught up on a number of articles I've saved recently, having found the Kobo integration. If you're like me and find you're forever thinking "I'll read that later", but never do, Pocket might be the tool you're missing. 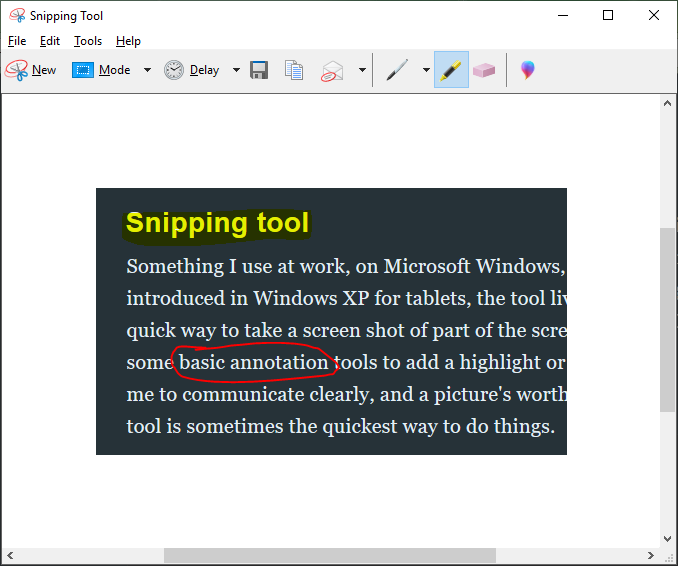 Something I use at work, on Microsoft Windows, is the snipping tool. Originally introduced in Windows XP for tablets, the tool lives on in Windows 10 (although it's about to move to the Windows Store) and is a quick way to take a screen shot of part of the screen - just drag a box over it. There's some basic annotation tools to add a highlight or a scribble. Given my job requires me to communicate clearly, and a picture's worth a thousand words, the snipping tool is sometimes the quickest way to do things. A screenshot of the snipping tool having taken a screenshot of this blog post. It's a basic tool, so you can't add fancy arrows or add text labels (the latter being a real shame) but if you're just after a quick screenshot it's fantastic. Later versions have the ability to set a timer so the screenshot can be taken as you're part way through a menu. I've used a number of music library programs over the years but found Clementine a couple of years ago while taking a look around (I'd previously used Banshee but there hasn't been a new release since 2014). Clementine is cross platform, working on Linux, Windows and MacOS and there's even a remote control app for your Android smart phone. It's most recent release, v1.3.1 was announced in 2016 but I can see there's still development within their Github repo. Pointing Clementine at your music folder prompts it to scan your files to build a library. You can then search the library by artist, song title, album name etc. in order to build your playlist. There's also support for additional sound effects such as rain and the sound of the Enterprise's engines. Support for streaming services is also available including Spotify, SoundCloud and podcasts (which it seems Clementine can download for you, although it's not a feature I use). Lyrics can also be displayed for the current song in the song info tab. Clementine showing a search for "rain" (left), my current playlist (right) and the "mood bar". Once a highly popular alternative to Internet Explorer, it's fair to say Firefox has lost a lot of market share (Google Chrome is now the dominant browser). Despite swathes of users leaving the browser it remains my preference. One of my favourite features is the reading mode you can enable to cut down the clutter and distractions on a page. It doesn't always appear (I'm guessing it detects if the page is an article or not) and I've highlighted it with an arrow in the image below. The reading mode button in Firefox. The browser is highly customisable with themes, plugins (add-ons) and it also supports Pocket (the same one I mentioned above). Mozilla announced the latest stage of Firefox, Quantum, in November 2017 and I was excited to get hold of it. Firefox had been getting slow (and stale) but Quantum certainly blew off the cobwebs and it flies in comparison (I'd say it was faster than Chrome too). Firefox is another cross platform tool, available on Linux, Windows, MacOS, iOS and Android. Finally, more a type of tool than a tool in its own right, but I spend a lot of time on the command line / in a terminal. I use various terminals day-to-day from BASH to a "command prompt" (MS DOS style) to PowerShell and often a command line is quicker for me than a graphical tool. There's lots of scope for automation when using a command line and I'm more than happy scripting arduous or oft repeated tasks. The best bit is that all of these tools are free (in one case, subject to a Windows licence) so there's no reason not to give them a try.